I heard lots about Hanoi food specially street food. Anyone help me find them please ? 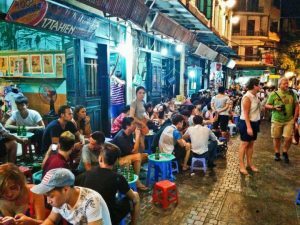 Hanoi Journey guide will then take you to one of Hanoi’s best kept secrets, a hidden street food restaurant to taste top ten street foods in Hanoi is Banh My Hanoi, Vietnamese Rice Wine and famous Egg Coffee. This hard-to-find café is one of the few left in the narrow street inside the old quarter of Hanoi. Or, if coffee is not your style, a cold beer awaits!. At the end of the trip you are free to continue exploring the area or your guide will assist you with directions or a taxi back to your hotel. You can buy foods, drinks and fruits from a local market in the Old Quarter or a self-selected shop. Some nice small restaurants sell food and coffee with lower prices than the street vendors. You can easily locate them. Many cheap places to eat can be found in the Old Quarter in Hanoi. in front of houses, roughly VND12,000-15,000 / bowl. There are small tables and chairs for you to sit, eat and watch people. You can walk easily and find the food you like when the streets are narrow and short.